This is a possible plant for my 2013 display. It is an albino avocado, grown from a seed I just placed in a windowbox. These is disagreement about whether a virus, stress on the plant, or planting an immature seed causes the loss of color. If it survives, it will be a cool plant to have in my display. 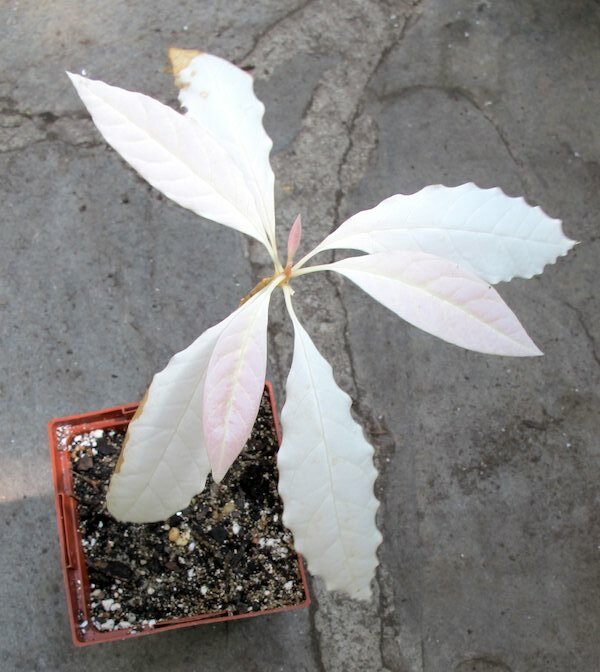 Your albino plant was as close as I could find when seeking information regarding pink avacados. I have 2 avacados that I rooted and potted together; one looks like all the others and one is fairly dark pink, including the stem. I was surprised when it first came up but expected it would turn green. It’s still dark pink, seems very healthy, has a half dozen leaves and is nearly a foot tall with two new limbs started. Are our albino and pink avacados fairly rare or generally so common they just don’t get much written about them? What I found out is that the albino avocado is the result of a virus that eventually kills the plant (mine has since died). I suspect the pink one have the same origin because if they are in the same pot as a normal one, then it is not something in the soil. I haven’t seen any pink ones but apparently the white ones are not very rare. I don’t know if you are interested but the pink leaves are turning yellowish and green and then to mainly to green with only some light veins remaining. So far. Better than mine, which croaked! It died because it had no chlorophyll so cannot photosynthesise and will never survive. The seedling can occasionally recover by growing from a shoot near the base which, for some reason has the correct genes. If your seedling was very pink it may have been due to a lack of light at first that it recovered from, once exposed to light.